Founded in 2005, Chinese Arts Now have championed the works of British Chinese artists, offering platforms for collaborations, allowing for new voices to be heard. A National Portfolio Organisation, they have been at the forefront of curating and producing ‘imaginative, diverse, vibrant’ productions reflective of Chinese stories and experiences. The Chinese Arts Now Festival will witness a selection of 60 arts events taking place up until Saturday 2nd February. The programme will include a mixture of music, drama, live art, dance, films and digital arts. Jennifer Tang’s production of Ghost Girl// Gwei Mui is currently playing at the Camden People’s Theatre. Ahead of the show, Jennifer talked to us about the show’s creation, the show’s exploration of what it means to be of British and Chinese heritage and creating narratives resonant to the British Chinese experience. Hi Jennifer! Your show Ghost Girl//Gwei Mui will show at the Camden People’s Theatre From 24th Jan as part of this year’s Chinese Arts Now Festival. How are you feeling ahead of the show? This show has been a long time in the making, so on one hand I’m really excited to share this with an audience, but on the other I’m also quite nervous because I’ve lived with it for so long – it’s scary sending it out into the world! It’s such a great opportunity to be part of the Festival, and to have been awarded the CPT Home Run commission, though, so mostly feeling grateful for the chance to be able to make the work and to do it with such a brilliant team. Ghost Girl//Gwei Mui looks to explore what it means to be British and of Chinese heritage. And will also give a voice to an ‘invisible minority’ in the UK. Why in particular did you want to explore these themes? A few years ago, it felt to me that there had been a flurry of productions which told Chinese stories. It was so exciting to see East Asian faces on stage, but I felt those productions did little to dispel the myth that Chinese people are still ‘far away’. The plays were often set in China, or abroad, or told through a narrative lens that viewed the Chinese characters as ‘other’. I just didn’t recognise my experience in these stories. 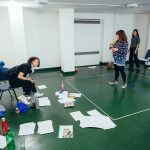 I wanted to make a work in response to these ‘Chinese’ plays; something that captured my experience of living in Britain as a woman of Chinese heritage. But I also wanted to explore Britishness and what it means to be British. Obviously, I didn’t know Brexit was on the cards back in 2014, and that theme feels weirdly prescient now, but it feels really important to question not just the idea of Chinese identity, but also what makes someone ‘British’. The Chinese community in the UK have long been saddled with this term ‘invisible minority’ and ‘model minority’ – mainly because, I think, the Chinese are overlooked and under-represented in mainstream media. Making a work that explored British Chinese identity was my very small attempt to try and bring more attention to the Chinese in the UK, and to share this experience of being labelled – and fighting against being labelled – ‘invisible’ – with a wider audience. The concept of the show was thought of by yourself, and you’ve also directed it. How have you approached creating the show? It started off as a verbatim project, and as such I began interviewing participants back in 2016. Through various rounds of R&D, where actors and I tried to thread the interview material together, we eventually managed to find a narrative device that held select voices of the verbatim material together. It just so happened that the narrative vehicle borrows closely from my personal story. I’ve tried to give as much of my story to the actors as possible, and let them mould / cut / re-shape it in the way they need to in order to best serve the story we are telling. We started off with a ‘map’ at the start of the process (not really a script, just lots of ideas thrown on a page) and we’ve ended up with a different kind of map. Some of the original ideas have stayed, some of them have been re-worked drastically, a lot of them have been thrown away. I have relied a lot on the cast and creative team to tell me what’s interesting, what’s not, what best serves the story. They’ve been at the heart of the process. You’ve commented that narratives like this usually take place within China or abroad, this in effect creating a sense of otherness and distancing UK experiences. At present do you feel that there are enough opportunities for East Asian stories to be showcased on stage within the UK? It feels like there are more opportunities than there have been in the past – and there are many in our theatre community who have campaigned tirelessly to get where we have got now. Is it enough? Probably not. But it’s better than it has been, for sure. I guess, for me, I’m slightly more interested in how we get better opportunities for East Asian artists that don’t exclusively rely on their ethnicity. When do we see East Asian actors playing roles that aren’t ‘Asian’ roles – i.e. takeaway owners, immigrants, victims? When can East Asian writers be commissioned to write stories that are not necessarily about an ‘Asian’ experience? When can directors make shows that are not exclusively about Chinese stories? Yes, we need these stories and the more of them we make for mainstream audiences, the better. But when East Asian artists are seen as simply ‘artists’, then I think we will have taken a step forward. I think it’s pretty bold, funny, shocking, powerful and hopefully the start of a bigger conversation. But then I would say that. To think about Chineseness differently. To think about their own perceptions of the Chinese, of Britishness, of their own sense of identity. To go and dig out their old 90s pop classics. Ghost Girl//Gwei Mui will play as part of Chinese Arts Now Festival; a festival creating a platform for British Chinese artists to produce resonant stories. How have the festival supported your vision? They believed in the idea in the start, and have contributed towards the making of the show not just through resources, but through emotional and artistic support. They’ve given me the space and freedom to create the work I want to make, and the encouragement to keep me going. Thanks, CAN! Keep going. Don’t give up. It’s your journey – don’t compare yourself to others as that’s the way madness lies. Ideas come from everywhere, not just from in the theatre – see / watch / listen / live as much as you can. Find a job that can pay the rent (and that’s not anything to be ashamed of, by the way), because earning money is going to take time. Build a network of directors so you can all support each other – it can get lonely at times. (But it’s the best job in the world). Good luck!